The present study comprises a simple and innovative approach for the synthesis of α-alumina powders involving the use of the metal organic precursor aluminum formate Al(O2CH)3 and phase transformations ending up with α-Alumina. 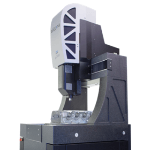 The intermediate and final phases are characterized by X-ray diffraction, infrared spectroscopy, nuclear magnetic resonance spectroscopy, thermogravimetric and differential thermal analysis. The soluble alumina precursor is spray dried to produce a nanometric alumina agglomerate. Alumina is an important technical ceramic, extensively used in microelectronics, catalysis, refractories, abrasives and structural applications. Especially, high quality corundum polycrystalline materials are used as electronic substrates and as bearings in watches and in various high precision devices. Therefore continuous efforts are being made to develop new processing routes for high quality alumina based ceramics. 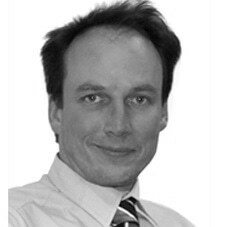 These efforts are in part responsible for recent developments of chemical processing (e.g. sol-gel and polymer precursor) approaches, especially for advanced ceramic applications [1, 2]. The main methods for preparing alpha alumina are: Calcination of the aluminum hydroxides, transition aluminas, aluminum salts, and solidification from melts. Less common methods are: hydrothermal synthesis at high pressure, vapor-phase transition, and burning aluminum in oxygen (Wartenberg 1952). Aluminum carboxylates, are widely used in textiles, paper and pharmaceutical industries, and, recently as advanced ceramics precursor . 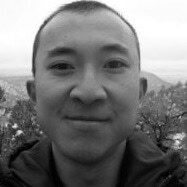 Lui et al. [4, 5] mention that aluminum formate hydrate and aluminum isobutyrate can be used as precursors to yttrium aluminum garnet. Rajendran, et al. and Chaplygina et al. reported that metallorganics might also be useful for making inorganic-organic hybrid materials. Narayanan and Laine  synthesized aluminum carboxylates from aluminum derived compounds, such as aluminum chloride and aluminum alkoxides prepared in one or two steps respectively with excess of acid anhydrides and/or carboxylic acids. Metal carboxylates are potential precursors for the formation of oxides at low temperature. Hence, there is a growing interest to produce α-alumina particles having desired physical properties to meet the ever growing demand. 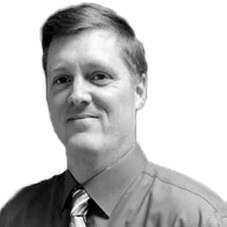 Chemical processing routes rely heavily on aluminum-containing metallorganics that derive from aluminum metal. Clar et al. , working with membranes obtained an aluminum formate and basic acetate gels alumina precursor from commercial pseudoboehmite. However, this precursor had to be heated to 1200oC to produce α-alumina mixed with a residual θ phase. The nature of the precursor has been found to influence the course of thermal decomposition as well as the phase evolution, and in particular the temperature of the α-alumina formation. In the work reported here a simplified route is established to synthesize α-alumina from aluminum metal reacted with formic acid catalyzed with mercuric chloride. The aluminum formate was readily produced via spray drying of solution and calcination at 1100oC, ending up with pure α-alumina. Aluminum formate Al(O2CH)3 was synthesized by chemical processing of a mixture of aluminum metal 1 mol (99.5% purity - La Paloma Compañia de Metales Leon, Gto. México), with formic acid 1.5 mol (85% purity - Karal, S. A. de C. V. Leon, Gto. México) using as catalyst mercuric chloride HgCl2 (99.5% purity – Sigma-Aldrich Co.). The resulting formate solution was spray dried (YAMATO Mini-spray dryer ADL31) to produce fine granulated alumina powders. This process allowed solvent elimination rendering a homogeneous mixture of powders. The granular powder was calcined in dry air at a rate of 5oC/min up to 1100oC and kept for an hour at temperature. Finally the grain size distribution was obtained by the AcoustoSizer IIsTM technique (Colloidal Dynamics Inc.). Phases were defined by thermal analysis, infrared (IR) spectroscopy, nuclear magnetic resonance (NMR), X-ray diffraction (XRD) and scanning electron microscopy (SEM). 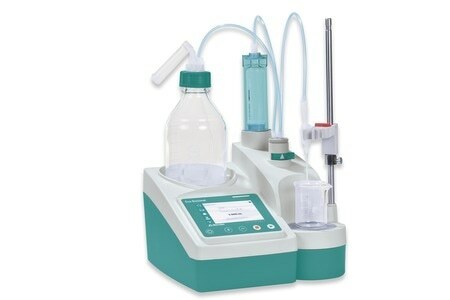 10 mg samples were run on a thermal analysis instrument (Model Q600 simultaneous DSC/TGA, New Castle, DE, TA Instruments). The heating rate was 10°C/min to 1400°C, with a nitrogen-gas flow of 100 cm3/min. Samples of 2 g were pyrolised in dry air at a rate of 5°C/min and a holding period of 1 h for various temperatures in alumina boats. Attenuated Total Reflection (ATR) (ZnSe crystal) technique was used fitted with a Fourier transform (The TENSOR™ 37 series FT-IR spectrometer, Bruker Optics Inc.). 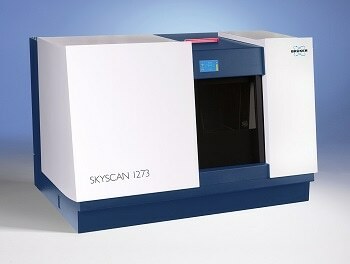 NMR 1H, 13C spectra of [Al(O2CH)3], were obtained on a Varian Gemini 200 NMR spectrometer by using 30 mg sample dissolved in D2O. The pyrolytic transformation of the precursors to crystalline products, as a function of processing temperature, was followed by XRD (Phillips 5000). The working voltage and current were 20 kV and 100 mA respectively with Cu Kα radiation. Microstructure was studied by SEM (JEOL model 6400). The aluminum formate synthesis is based on the mercuric chloride catalyst used to amalgamate the metallic aluminum, which in turn is easily attacked by formic acid, thus rendering an aluminum salt readily soluble according to the reaction (1). In this reaction, in the first stage, aluminum reacts with HgCl2 producing solid mercury-aluminum and aqueous chloride. In the second stage the amalgamated aluminum is dissolved in formic acid liberating hydrogen followed by the formation of the aluminum salt. TGA profile for aluminum formate decomposition (Figure 1) shows three regions of mass loss, with a total ceramic yield of 68.13% compared to a theoretical yield of 68.52%. DTA (Figure 2) reveals endotherms with maxima at 85, 240 and 340°C. At 85°C decarboxilation takes place according to the reaction 2. At 20-195°C the weight loss is 16 wt% for the formation of crystalline AlOH(OOCH)2 as an intermediate reaction. At 240°C the dehydration reaction follows reaction 3. At temperatures < 285°C the weight loss is 26.42 wt%. At temperatures > 355°C the precursor transforms to amorphous Al2O3 (reaction 4). At 945°C, low intensity broad peaks appear that are indicative of the crystallization of η-Al2O3. It should be noted that the η-Al2O3 appears at much lower temperature (between 200-600°C) for bayerite precursors. However, Liu  has also reported such temperature shift to 870°C for the aluminum formate hydrate. 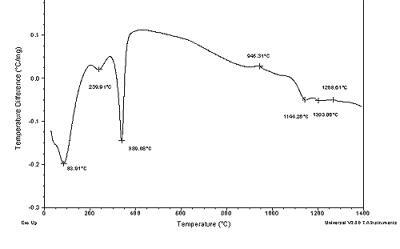 At 1100oC the transformation to α-Al2O3 sets in and at 1260°C exothermic peak indicates the crystallization of α-Al2O3. XRD, NMR and IR allowed some crystallographic information. Aluminum formate spectrum presents itself in amorphous (Figure 8a) and crystalline form (Figure 3). The amorphous phase was obtained from the spray drying process. The crystalline form corresponds to the orthorhombic phase (JCPDS file card no. 38-05839) in agreement with data from Chaplygina et al. . In addition Figure 4 shows characteristic chemical shifts at 169 13C and 8.3 1H ppm of the carboxylic group see Table 1. On the other hand IR spectra shows υC=O characteristic bands (1620 and 1400 cm-1) which belong to the orthorhombic coordination. Therefore we conclude that the formate exhibits coordination type a, see Figure 5 in agreement with the literature [8, 10, 11]. Figure 3. XRD spectra of crystalline phase of Al(O2CH)3 (JCPDS file Card No. 38-05839). Figure 4. NMR spectra: a) 1H and b) 13C. Figure 5. Orthorhombic Structure of the Formate aluminum. Figure 6. Al(O2CH)3 IR-ATR Spectra. Figure 7. 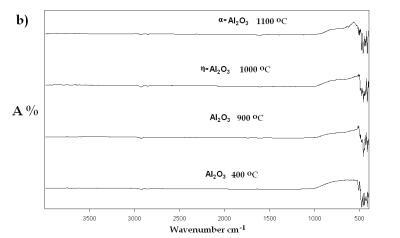 IR spectra of Al(O2CH3) Pyrolyzed at selected temperatures: a) Carboxylate decomposition and b) transition to α-alumina from an amorphous phase. Figure 8. XRD spectra of Al(O2CH3) Pyrolyzed at selected temperatures: a) Carboxylate decomposition and b) transition to α-alumina from an amorphous phase. Figure 9. SEM image of α-Al2O3 (calcined at 1100oC) obtained by Spray Drying. Figure 10. Average Size Distribution of α-Al2O3 powders. A simplified route was established to synthesize low temperature α-alumina from aluminum metal. The resulting aluminum formate soluble salt may be used either as an α-alumina or hybrid precursor. 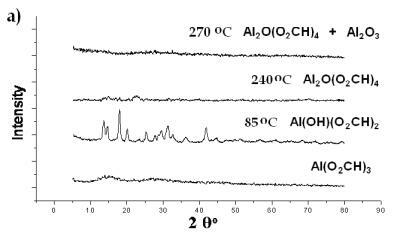 Phase transformation of bulk samples of Al(O2CH)3 were examined in which two stages were clear. The first stage corresponds to the decomposition of the aluminum formate followed by the transition to α-alumina from an amorphous phase. Examination of the chemical shifts in NMR as well as the position of the IR bands in conjunction with X-Ray diffraction allowed to identify a carboxilate coordination with aluminum in which one aluminum binds to a bidentate carboxylate. 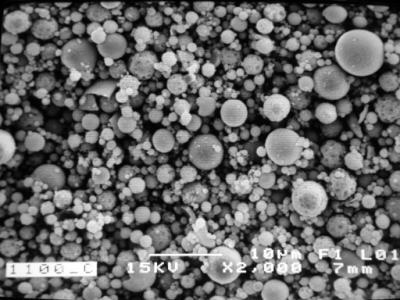 The aluminum formate precursor rendered a nanometric agglomerate (d50 = 0.789 μm) spray dried α-alumina powder which was considered adequate for future forming ceramic parts via standard pressing techniques. Table 1. NMR Chemical Shifts (in ppm). Table 3. IR Peaks of Transformation of Al(O2CH3). The financial support of the “Coordinación de la Investigación Científica de la Universidad Michoacana de San Nicolás de Hidalgo” is greatfully acknowledged. 1. A. Pathak and P. Pramanik, “Nano-Particles of Oxides through Chemical Methods”, PINSA, 67  (2001) 47–70. 2. R. Roy, “Ceramics by Sol–Gel Route”, Science, 238  (1987)1664–69. 3. A. L. Mckenna, in Kirk-Othmer Encyclopedia of Chemical Technology, Aluminum carboxylates, Wiley, New York, vol. 2 (1991) 273-281. 4. Liu, Z.-F. Zhang, B. King, J. Halloran and R. M. Laine, “Synthesis of yttrium Aluminum garnet from yttrium and aluminum isobutyrate precursors”, J. Am.Ceram. Soc., 79 (1996) 385-387. 5. Y. Liu, Z.-F. Zhang, J. Halloran and R. M. Laine, “Yttrium Aluminum Garnet Fibers from Metalloorganic Precursors”, J. Am. Ceram. Soc., 81 (1998) 629. 6. M. Rajendran, A.K. Bhattacharya, “Low-temperature formation of alpha alumina powders from carboxylate and mixed carboxylate precursors”, Mater. Lett., 39 (1999) 188–195. 7. N. M. Chaplygina, I. Z. Babievskaya and I. B. Kudinov, “Preparation and Physicochemical Properties of Al(HCOO)3.3H2O”, Russ. J. Inorg. Chem. (Engl. Transl. ), 29  (1984)1260. 8. R. Narayanan and R. M. Laine “Synthesis of soluble aluminum carboxylates directly from aluminium hydroxide”, J. Mater. Chem., 10 (2000) 2097-2104. 9. C. Clar, A. N. Scian and E. F. Aglietti “Synthesis and characterization of aluminum carboxilates gels”, Thermochimica Acta., 407 (2003) 33-40. 10. Christopher C. Landry et al, From Minerals to Materials: Synthesis of Alumoxanes from the Reaction of Boehmite with Carboxylic Acids J. MATER. CHEM., 5 (2) (1995), 331-341. 11. J. D. Donaldson, J. F. Knifton and S. D. Ross, Spectrochim. Acta., 20 (19649, 847. 12. K. Wefers and C. Misra “Oxides and Hydroxides of Aluminium”, Alcoa Laboratories (1987) 32-33. This paper was also published in print form in “Advances in Technology of Materials and Materials Processing”, 8 (2006) 55-62.